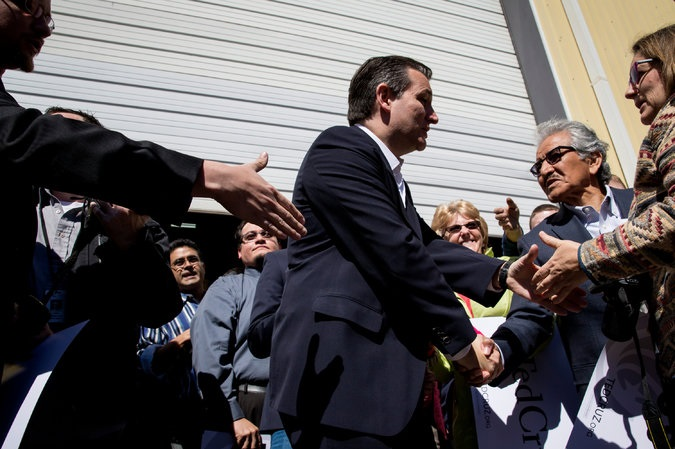 HOUSTON — Senator Ted Cruz cannot stop talking about the Alamo. Since announcing his bid nearly a year ago, Mr. Cruz has placed next week’s so-called Super Tuesday voting contests at the center of his plans: He would sweep through the heavily evangelical Southern primaries, advisers said, and run up the margin in his delegate-rich home state. But as Donald J. Trump threatens to steamroll through the primary season, muscling Mr. Cruz and Senator Marco Rubio of Florida aside enteringThursday’s debate, there has been a reckoning deep in the heart of Cruz campaign headquarters: Texas could, for all practical purposes, be Mr. Cruz’s last stand. On Wednesday, amid the machinery of a pipe and weld fittings manufacturing plant in Houston, Mr. Cruz reveled in a reception befitting a native son. Before a rollicking crowd that often mouthed his punch lines, Mr. Cruz received the endorsement of the state’s governor, Greg Abbott, his former boss. Mr. Cruz reminded Texans that they were “not a people who give away our freedom quietly.” He recalled a slogan from the Texas Revolution (“Come and take it!”) and read from his iPhone a letter by the mission’s commander, William B. Travis, who died at the Battle of the Alamo. A Monmouth University poll released on Thursday showed Mr. Cruz in the lead with 38 percent support among likely Republican primary voters, outpacing Mr. Trump (23 percent) and Mr. Rubio (21 percent). Other polls have suggested the race is tighter. Candidates who had ties to the state, like Jeb Bush and Rick Perry, have faded. Mr. Perry, the former governor, endorsed Mr. Cruz. But the state’s delegate breakdown is proportional, and somewhat complicated, unless a candidate wins in a blowout. Of the 155 delegates, 108 are allocated across 36 congressional districts. If a candidate clears 50 percent in a district, he wins all three delegates for the district. Otherwise, a district winner receives two delegates and the runner-up gets one.